Soar over the Honolulu skyline and Waikiki's white-sand beaches as you discover the seaside city of Oahu. From your guaranteed window seat enjoy views of Diamond Head, Punchbowl Crater, and the U.S.S. Arizona Memorial at Pearl Harbor. Choose our exciting doors-off option and get crystal clear photographs of this beautiful city. 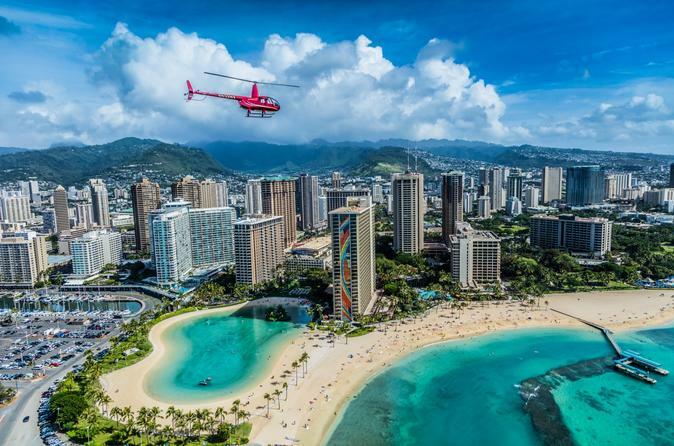 Fly high above the world famous city of Honolulu on our City-By-The-Sea helicopter tour. Your helicopter takes off from Honolulu International Airport and takes you over Honolulu Harbor and Oahu’s beautiful South Shore. Flying past Honolulu's skyline, you can see the busy shops of the Ala Moana Center and the popular picnic grounds of Magic Island. As you near the white-sand beaches of Waikiki marvel at the multitude of surfers, beachgoers, sailboats, and swimmers savoring the beauty and joy of the island affectionately known as The Gathering Place. Rising from Waikiki's beaches is mighty Diamond Head. Your bird's eye view will let you peer directly into the crater and wave to the hikers on the ridge beneath you. After flying over Punchbowl Crater and the U.S. National Military Cemetery of the Pacific, you head for Pearl Harbor. At the famous port, you will pass over the USS Arizona memorial and the famous Battleship Missouri. At the end of your tour, you will understand why so many people fall in love with this city-by-the-sea.